Minimum extraction of non sugars. Uniform supply of cane to avoid reduced crushing situation. The greater the extraction of sugar in the first mill the less difficult in the task left to the following mills to recover more sugar by the trouble some step of wet extraction and better is the overall extraction of the tandem. It is proved that a gain of 1% in primary extraction gives a gain in total extraction of 0.12% in 12 roller tandem, 0.10% in 15 roller tandem and 0.09% in 18 roller tandem. It is therefore, necessary to observe first mill extraction carefully and report the figure in weekly chemical control reports. 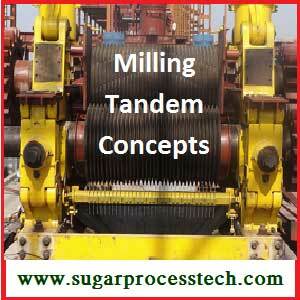 A tandem of 3 roller unit should attain a minimum of 60% primary extraction. It may reach easily to 70% and as high as 75 to 80% according to fibre% cane, preparatory index, feeding, mill setting, hydraulic press, proper juice drainage and optimum mill roller speed. With a view to obtain high primary extraction, the first mill should be provided with Donnelly chute, under feed roller and a lotus roller. **All above parameters impact on crushing rate. The mill extraction of the remaining mill should be in the range of 40 to 45%. However to get 50% is possible with strict supervision on operative parameter and roller lifts. It will be necessary to do fine adjustments in operative parameter to get desired each mill extraction and whole plant extraction. The improved cane preparation and increasing crushing, provision of high imbibition water have increased juice quantity in the mill. If this increased juice is not drained effectively, then it affects the mill extraction adversely and will demand extra hydraulic load increasing the power demand in the mill. The pressure feeding equipments, lotus rollers and differential are used in the mill to ideal with this increased juice. Out of these differential grooving is discussed in detail. To press and squeeze the prepared cane in 1st mill and bagasse in other mills for juice extraction. To drain the juice effectively from mill. To mill the bagasse further to get the uncut juice cells broken to help to increase the extraction in the following mill. To drive the bagasse through the mill effectively. The following types are used on rollers to get above functions. For better performance and better extraction the mill pitches may be further reduced. But it will effect on crushing rate. As peripheral speed of the rollers i.e. the linear speed of a point at the mean diameter of roller. It is generally expressed in m/min. Lower the speed of the mill, the bagasse in the mill have more retention time for effective juice drainage. Lower speed of roller improves co-efficient of friction and it will have better grip on bagasse reducing the slippage. It not only increases extraction but also allows to adjust mill at higher fiber index i.e. lower openings without increasing the hydraulic load. This results in improvement in extraction and reduction in reabsorption factor effecting in saving in the power requirement in the mill. The cane preparation of higher cell opening with long fibers and installation of pressure feeders of better designs are essential facilities for the mills to run at lower speeds. Fine cane preparation and effective juice drainage from bagasse in pressure feeder will allow to run the mill at lower speed resulting in reducing the Reabsorption and allows to close the mills. This will shift the neutral plane towards axial plane. This will improve extraction & reduce power in the mill. Nitrogen gas pressure in accumulator should be in the range of 70 to 90% of the hydraulic pressure. Nitrogen gas pressure should never be higher than the oil pressure. If preparatory Index is more than 85, then the specific hydraulic pressure will be reduced by 2 to 4 Ton/dm². Proper setting of scrapers knives. The ratio of donelly chute to fourth roller opening should be 2.5 for 1st mill to 2 for last mill. Pressure chute should be symmetrical to the axis joining midpoint of PF opening and mill feed opening. Imbibition and juice maceration plays important role in achieving better mill extraction. Imbibition water dilutes the juice in bagasse and reduces it viscosity. The characteristics of low viscosity of juice increases the flow of juice through bagasse. The hot water further helps in reducing the viscosity of the juice. However higher temperature of water sometime leads to slippage of bagasse in the mill. The higher imbibition water is restricted due to capacity of boiling house and availability of steam and therefore it restrains to increase crushing rate. It may please be noted that higher imbibition water do not increase the moisture in the bagasse. But inadequate juice drainage, low compression, higher speed, improper cane preparation are the main reasons for increase in moisture of bagasse. Optimum temperature of hot water 70oC. Efficiency of imbibition increases these by extraction increases. The mixed juice temperature also increases by 10o to 15oC these by the exhaust requirement reduce by about 2 to 2.5%. Bagasse temperatures also increase to about 45o to 50oC. As it travels upto the boiler about 1% of moisture will be evaporated. These by reduce the moisture 1% by 1% and GCV increased by 45 – 70 Kcal/Kg. More wax soluble in juice, which gives problem in clarification or filtration. Mill capacity slightly reduces because of roller polishing i.e. gripping action is reduced. (if pro-feeders are then this problem can be reduced). Last mill bearing temperature increases. Range of imbibition efficiency is around 60 to 70% . It is assumed that top roller lifts only that value considered during mill setting calculations. Normally actual lift of top roller during operation is higher considered in mill setting calculation. Higher thickness of cane/bagasse blanket passes through mills due to excessive lift of top roller. 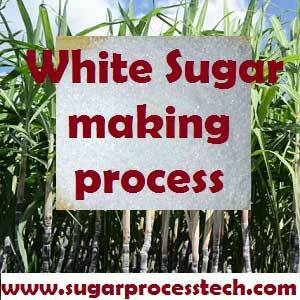 This leads to poor extraction of sucrose and results in higher sugar loss in final bagasse. Hydraulic load applies on top roller simply by assumption/experience. It is seldom to consider the lift of top roller while deciding hydraulic pressure. To monitor lift of top roller. Analysis of bagasse leaving the mills for free pol and total pol. Measurement of temperature of juice on feed and discharge. Aim of maintenance is to keep down. TO ACHIEVE FURTHER BETTER RESULTS. To install pressure feeders ,facilitates to run at low speeds. To replace transmission gears with planetary gears for reduction of power consumption and increase of mill crushing capacity . 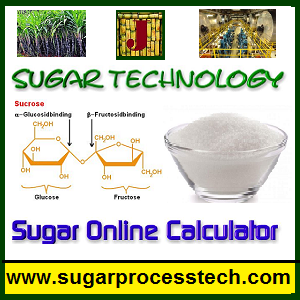 Publisher – Orgnization : www.sugarprocesstech.com. In this article given formulas for calculate vapour line dia for juice heater and evaporator and also proved online calculator. Excellent article, keep it up Seetarama Rao Garu. 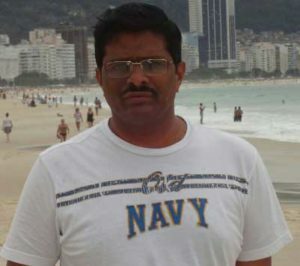 K. Lokanadam, GM, ARYAN BOILERS PVT LTD. Very good tips for general operation and control of the mills , author needs appreciation. Further a little more information for operation and control will be an added assets to milling engineers. It is open discussed website sir. Any technologists can be expressed his views and share his knowledge regarding the sugar industry. If you interested please share your knowledge. sir you explain technically each process. This this is more appreciable work. I know you given this all the data after his experiment and after a good R&D. This time I am studying in vsi Pune and your all these given information is a calibration for me as a calibration and practical between the given theories and your experience. I would like to thank you for this exposure of knowledge. I Talk to you more if you reply me. i need in details mill setting calculation procedure…. This great ground work and we taken lot of information from ur website this will make lot of help us. Thank you sir ….very useful data in short . 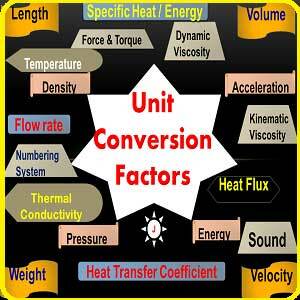 Thank you sir…very useful data in short ..
Sir how to calculate mill size according to flow rate?? Thank you for taking the time to share this information. Very informative.